Yes, technically the Megola is a motorcycle, but it has so many scooter-like attributes that we thought it’d be something scooter fans should see. 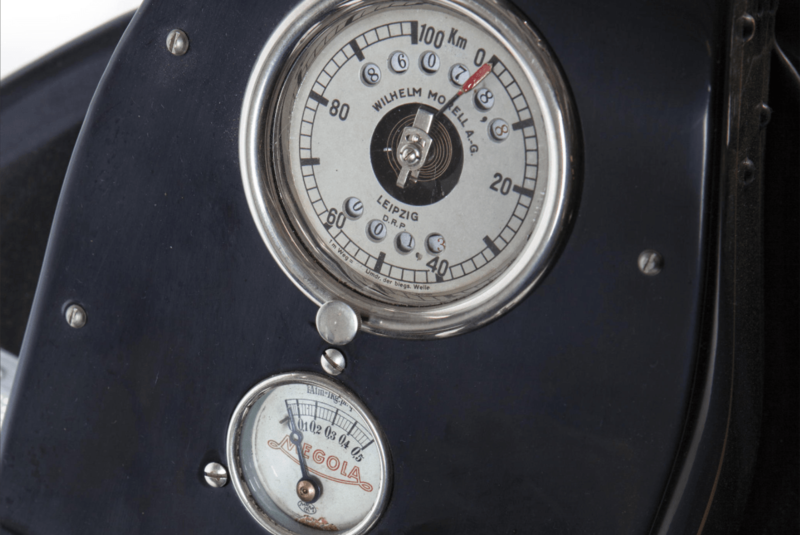 Built originally in Germany in 1920, the Megola features many mechanical and ergonomic design details that where both ahead of their time, and indicative of cutting edge technology of the day. 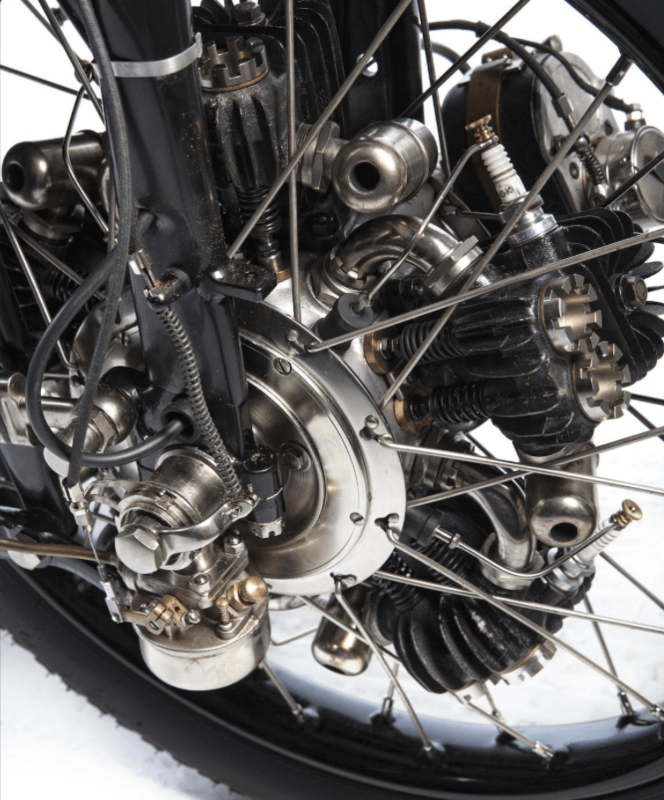 Most striking is the Megola’s drive system: a 5-cylinder rotary-type engine fitted inside the front wheel. We’re all familiar with hub motors in electric vehicles, but this is a whole other contraption, and all from nearly 100 years ago. What exactly is a rotary engine? They’re best known for use in aircraft during WWI. Unlike the radial engines that came later, rotary engines would fix the tail-end of the engine’s crankshaft to its mounting point. Then, as the engine ran, its crankshaft would stay stationary while the cylinders and outer engine cases rotated around it. Imagine the engine in a car spinning along with the front wheels! Same idea. In the case of WWI aircraft, the propeller would be mounted to the engine cases and spin along with them, creating thrust. 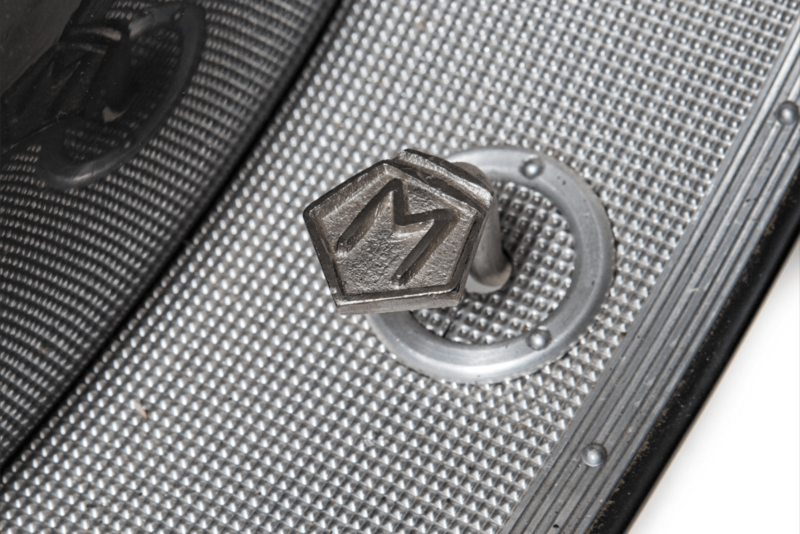 In the case of the Megola, the crank is attached to the front fork and the engine/wheel turn as a unit as the engine runs, providing forward drive. While no transmission was included, a 6:1 gearing ratio built into the assembly meant that the wheel turned once for every six rotations of the engine. 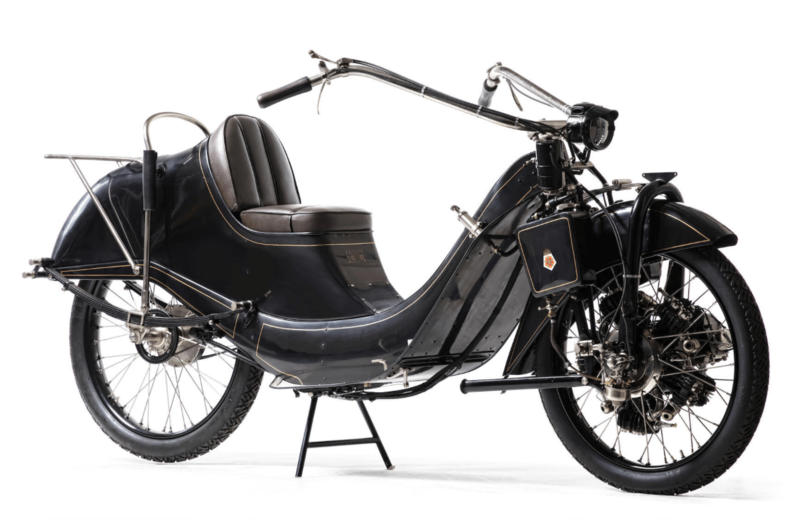 The 5-cylinder rotary in the Megola totaled 640cc, and produced 14 hp. That’s about what you’ll get from a 200cc scooter today. This would propel the standard Megola up to a top speed of just over 50 mph, but tuned versions were reported to do almost 90 mph. With that much un-sprung weight, front wheel drive, plus the added rotational mass/momentum of that engine, the handling characteristics of the Megola must have been interesting to say the least. The upside of a rotary-type engine is that its cylinder cooling fins are constantly moving and being cooled in the air. They were also considered to be very reliable for their day. That’s where the upsides end, unfortunately. In the case of the Megola, having a rotary drivetrain meant no clutch and no transmission or neutral gear. To stop, you had to actually kill the engine, which is fussy to say the least. Given the relative lack of traffic in 1920, this was perhaps much less of an issue than it would be today, but it still makes “suicide” shifting look like twist-and-got by comparison. We don’t see this making a comeback anytime soon. Pragmatic shortcomings aside, the Megola is still a fascinating machine with lots of interesting design decisions that were cutting edge in their day. Front and rear suspension were included on the touring version of the Megola, which was rare in its day. The seating position is not unlike the Honda Helix and other maxi-scooters still on the roads today. 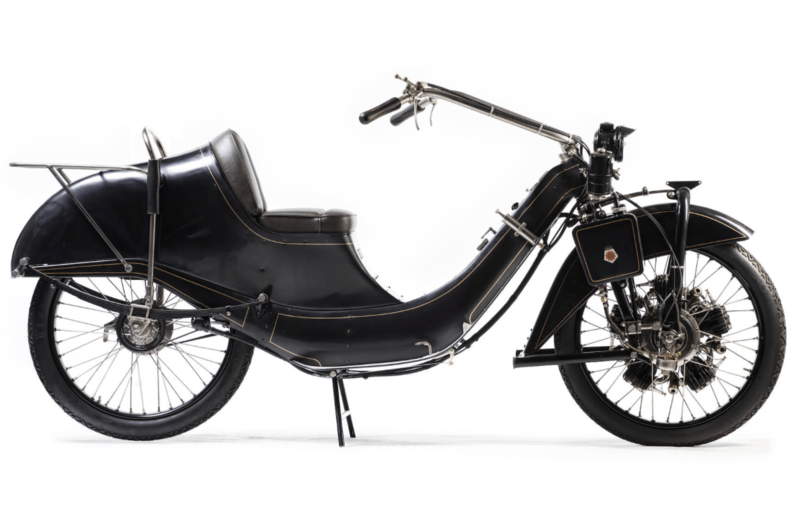 Also innovative, the body is a steel monocoque, not unlike a Vespa, which is rare for any era, including today. 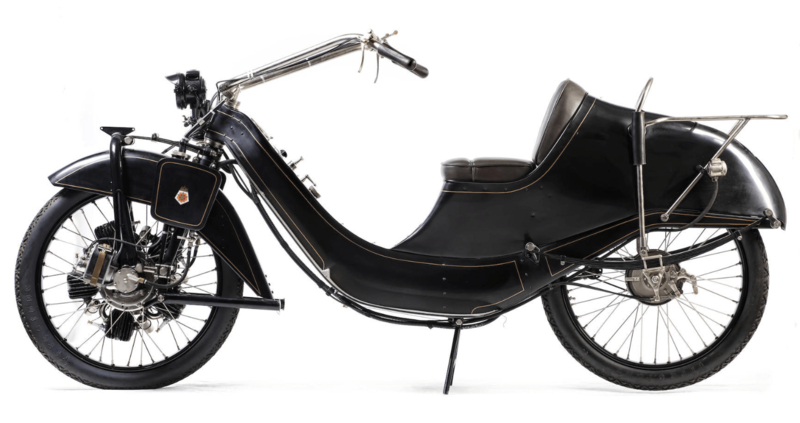 Because the body was the chassis, and it was all made of steel in a day before anti-corrosion techniques, fewer than a dozen of the original 2,000 unit production of Megolas still exist today. Love the improvised water cooling.